Presale tickets for the first announced shows of Sting's European Symphonicity tour go on sale to members of the Sting Fan Club beginning today! Presales for Symphonicity concert dates in Oslo, Copenhagen, London, Newcastle, Florence, Milan and Rome go on sale to members of the Fan Club beginning today, 26 May, at 10am (local time). Starting at 10am (local time), Legacy members will have a one hour advance window with the presales then opening up to all members at 11am (local time). Tickets for these shows go on sale to the public beginning on 28 May with various starting times. American Express cardmembers are also offering an exclusive opportunity to purchase advance tickets from a separate allotment for some shows with details mailed to cardmembers weekly directly from American Express. Backed by the 45-piece Royal Philharmonic Concert Orchestra and a quartet consisting of longtime Sting guitarist Dominic Miller, David Cossin (multi-percussionist), Jo Lawry (vocalist) and Ira Coleman (bassist), Symphonicity finds Sting performing the most celebrated songs from his diverse and illustrious career re-imagined for symphonic arrangement, conducted by Steven Mercurio (Pavarotti, Bocelli). Among the reinterpreted selections newly orchestrated for this tour are fan-favorites from The Police such as "Roxanne," "Next To You," "Every Little Thing She Does Is Magic" and "Every Breath You Take," along with notable songs from Sting's enduring solo career, including "Englishman in New York," "Fragile," "Russians," "If I Ever Lose My Faith in You," "Fields of Gold," and "Desert Rose." 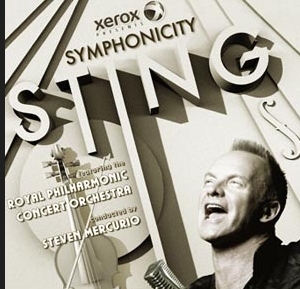 To accompany Sting's highly-anticipated world tour, Deutsche Grammophon will release a companion CD, Symphonicities, this summer. The new studio album serves as the ultimate commemoration of the live concert experience. The first single, "Every Little Thing She Does Is Magic" is available digitally, now. Additional highlights include fan-favorites culled from The Police songbook such as "Roxanne" and "Next To You," as well as songs from Sting's illustrious solo career including "Englishman in New York," "I Burn for You," "Why Should I Cry for You" and "She's Too Good For Me," among many others. Symphonicities is produced by Rob Mathes and Sting, and mixed by Elliot Scheiner (Steely Dan, Fleetwood Mac) and Claudius Mittendorfer (Interpol, Franz Ferdinand).